Writing horn arrangements is a skillful balancing act. Get it right and your track has instant power and energy. Get it wrong… your track drowns in a sea of decibels. So how to write horn arrangements with ease and get it right? 1. Pick your instruments wisely because they determine the volume, mood, style and general feel of your track. 2. Be careful with elaborate moving brass parts or they’ll overpower everything else. 3. Before you write anything down, try singing the line. If it’s difficult to sing, ditch it. 4. Make the most of dynamics, since horn sections are loud. More than any other section arrangement, your choice of forces is important because it determines the volume, mood, style and general feel of your track. A lazily relaxed tenor sax and trombone will give you an entirely different vibe to the legendary Tower of Power line-up – 2 trumpets, 2 tenors and baritone sax. Or you may want the brassy rock-orientated sound of 2 trumpets, sax and trombone. Or how about transforming your great melody into a triumph? Go for a solo French horn. To be honest, there aren’t any strict rules on ensembles. If you’re new to brass arranging, there’s only one way to make your decision – listen to as much as you can. And then… listen to some more. Let’s start with the power houses – Bb trumpet, trombone and French horn. Trumpet players love a melody line. They’re also capable of technical wizardry and high-energy punctuation hits –including fast successive notes. It’s best to steer clear of anything below middle C. Unless you’re specifically after dark and muddy, of course. Don’t be restricted by the instrumental hierarchy – it makes things boring. For example, your trumpets and saxes don’t have to rule the melody line. Trombones are obviously great for pedal and bass notes, and the slide is tailor-made for glissandi – but it’s surprisingly agile in the upper half. Mix things up. Try writing a trombone melody above an alto sax bass line. French horns are a law unto themselves. They’re not strictly brass, and they often masquerade as woodwind. We’ve included them here for 2 reasons – the classy melody potential and the glissando `rip’. For the sake of the player it’s best not to overdo the rip. They hurt, especially in the upper register. Saxes are the flexible crossover point between the horns and the woodwind. They give you the best of all worlds – agility, soaring melody and powerful percussive hits. 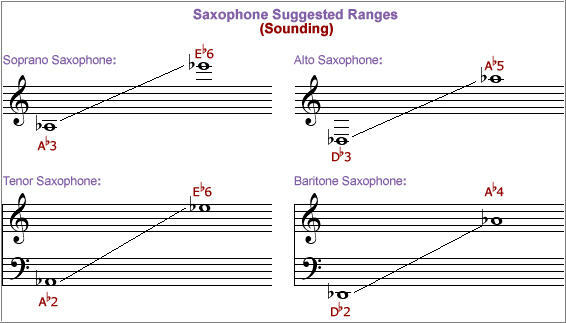 Here’s the range and sounding pitch of all four saxes. The soprano sax will give you a `woodwindy’ sound with added flexibility. In the middle register it sounds like an oboe, but with a softer timbre, so it’s perfect for that heart-breaking melody. As with oboists, most professionals can play softly in the lower register, but they won’t thank you for asking them to. If you want that gorgeous loud honking sound, the tenor and baritone saxes will provide it. For a tenor, put it in the loudest bottom 4th of its register – Eb down to Bb. As a solo sax, the tenor is probably the most flexible because it gives you melody, agile runs and percussive hits. However, try and avoid the obvious. The baritone may be the ultimate power-honk, but at the top end it’s surprisingly mellow, plaintive and melodically agile. The alto sax is great for the melodic lead and in unison or octaves with other saxes or brass instruments. If you want the screaming sax sound, its altissimo range will reach about an octave higher than our pitch illustration. However, not all players can do this so be prepared for negotiation. While it’s fine for string arrangements, elaborate moving brass parts will become the main event. They’ll overpower everything else. Start off with a strong melodic statement but after that, think riffs and accents. Throw in some rhythmic repeated-note punctuation at the end of a line. For a dramatic exclamation mark, try a short simple melodic lick. The most memorable brass arrangements are the most straightforward. The melody doesn’t jump about all over the place – the intervals are probably within a 5-note scale – and the chord sequences are dead simple. Before you write anything down, try singing the line. If it’s difficult to sing, ditch it. If your idea is still stuck in your head 30 minutes later, you’ve struck gold. Horn sections are loud. As players, their favourite word is `fortissimo’. However, if you keep the volume cranked up to 11 you’re wasting an opportunity. All instruments in the horn section are brilliant at the crescendo. One of the most effective techniques in brass arrangement is forte-piano-crescendo. If you’re used to composing on a keyboard, it’s easy to make potentially embarrassing mistakes. Session sax players, for example, will specialise in more than one instrument. Give them a few bars to change between instruments or you’ll end up with flying saxophones. Aside from this, the two most common mistakes made by new arrangers are these: not allowing time to breathe, and over-writing in the upper registers. Bear in mind that high sustained notes are physically tiring on any wind instrument, but especially on horns. At worst, you may destroy your player’s embouchure. If in doubt, ask the player. Session musicians are unrivaled experts on what’s playable and what’s not. Alternatively, if you want a horn arrangement that’s playable and memorable – something that lifts your track to the next level – how about handing it over to a professional. Do you think that’s beyond your budget as a working musician? Actually, it isn’t. Supreme Tracks gives you access to superb BRASS ARRANGERS at rates you can easily afford. And once you’re happy with the arrangement, we can also provide you with world-class BRASS SECTION RECORDING SERVICES. Send us your project and we’ll do a free assessment on how to make your tracks blow with steam.